I apologize for the long absence from this blog– between the final weeks of school heating up with the rapidity of an electric skillet (plugged in), a mad summer internship search, and the apartment hunt, things have been a little crazy. And really, there’s not too much to say on the latter front. Eva and I saw three apartments this Sunday and they were all… achem… shitholes. On the upside, we finally met our broker, and we can report that she’s a lovely, patient lady. So I figured I’d just continue our long, extended, painfully detailed tour of room 218. You’ve already seen where I get my beauty sleep, where I think about sometimes sitting down to work, and where I perch to judge peons on the street below. So what could be in store today? That’s right: where I stash the munchies. It is my dream to someday have an exceptionally organized kitchen. My food will be concealed behind closed cupboards. Knives will reside in a drawer in descending order of size, and my empty booze bottles will be tucked away beneath the sink, where they belong. I already have my spice racks picked out. Unfortunately, this dorm room is not the place for that. But I still get hungry. Especially late at night. I’m eating right now. Because I like a good retrospective, let’s take a trip back in time. Back to another decade. Back to this fall, 2009. Don't look it in the eyes, whatever you do. I know, what a mess. I didn’t really think much about making this area look nice for a few reasons. First, I was lazy. 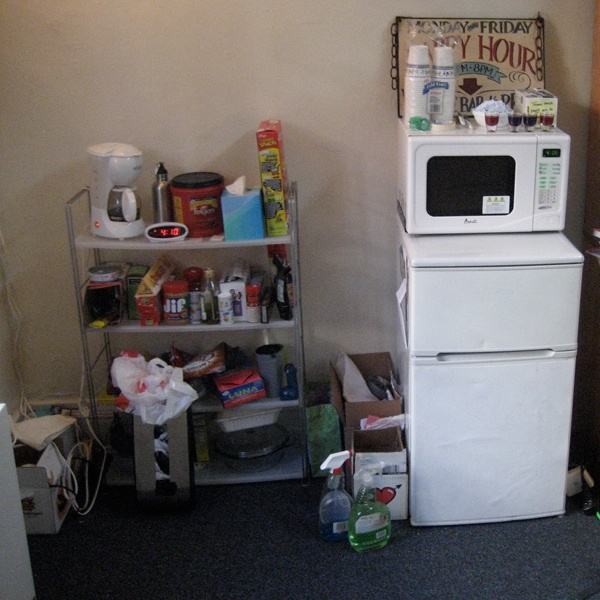 Second, a mass of food and a minifridge-microwave combo is unattractive by nature, and it didn’t seem like a lot could be done. Third, I hate that shelving. 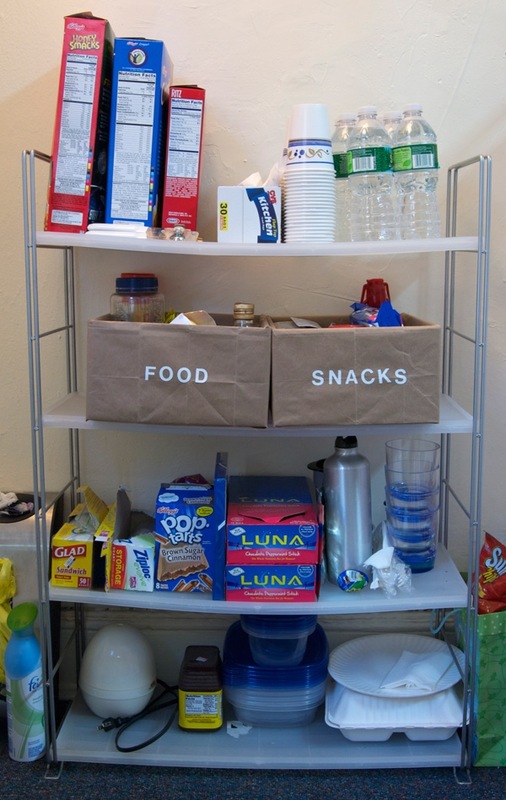 I love the Container Store, and trust it implicitly, but this “Janus” shelving is a terrible product. Look at the way it bows! And there’s nothing even that heavy on it! Plus, it was stupidly expensive. I can’t wait to craigslist it as soon as we get out of here and pawn it off on some other poor soul who doesn’t know quite what they’re in for. But eventually, I had to tackle this issue head on. I needed a way to conceal some of that food mess, and I needed to rethink my use of the space in order for it to meet its full potential. But with my mouth still bitter from the taste of Container Store betrayal, and my wallet empty from too much takeout, I needed to get creative. Luckily, takeout was part of the answer to my troubles. Not my picture, I've never seen it in the daylight. 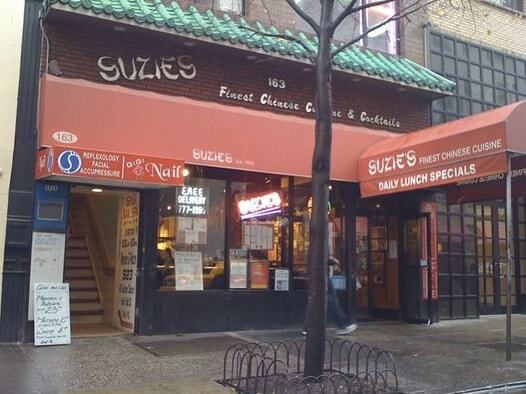 There’s a Chinese restaurant I get takeout from far too often called Suzie’s. I like them because they’re open very, very late. And when you get takeout, they give it to you in brown paper bags. 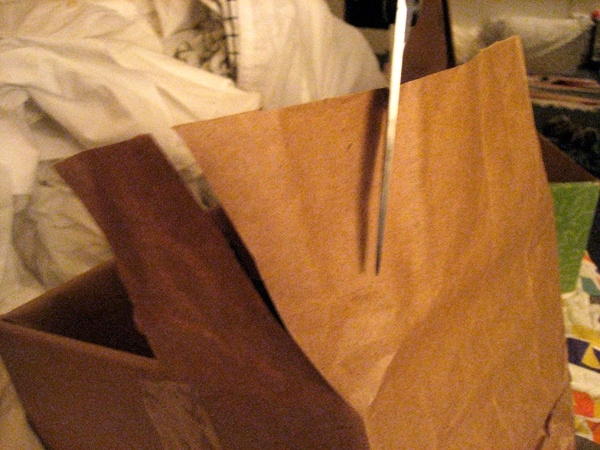 I always keep them because you never know when you might need brown paper, and they fold flat. This a behavior I wholeheartedly blame my mother for. Thanks for the fruit, Mom and Dad! My parents are lovely people who signed me up to have a box of fruit sent to me every month from their pals, Harry & David. I imagine these men to be old, vegan hippies. So far, they’ve sent me pears, bananas, honeybell oranges, and pineapples. But I digress, the important part is that they come in these nice cardboard boxes. This is actually a single box, but the two sides are roughly the same size, one is just a tiny bit bigger to fit over the other one. You might see where this is heading. If you need instructions, tough luck. So I separated the glued parts of the bag to make a big rectangle, then cut the top strip off where the handles are attached. 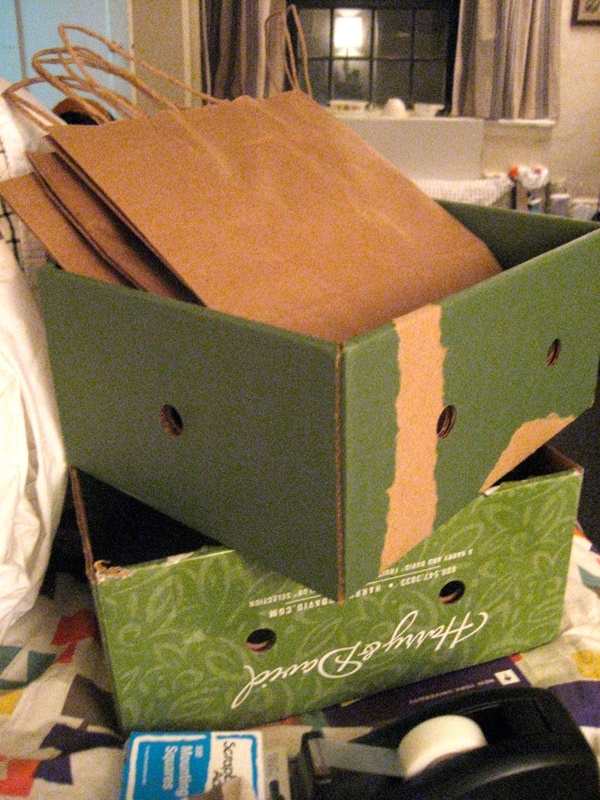 Then I just covered the boxes with the brown paper. Angle your corners, duh. Congratulate yourself for recycling, or whatever. Anddddd After! Third shelf down, not my stuff. But the hardboiled egg cooker on the bottom is. I added some plain white vinyl Helvetica letter stickers (a necessity in any self-respecting craft box) I already had, and that’s that. Still not great, but better and the best it’s gonna get for this room. Note: not the actual time. Unless you really are reading this at 6:34 pm. As I’ve mentioned, I like to scavenge from the things people leave on the curb outside their houses. It’s not trash, really. 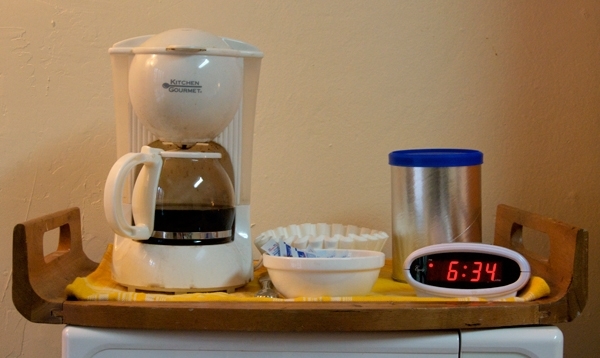 So I found the tray (the wood’s in bad shape, hence the yellow towel), and it fits on top of the microwave and holds the coffee goods perfectly. And yes, I keep an alarm clock across the room. I am a nightmare to wake up in the morning, so after too many missed morning classes I found the smallest, cheapest clock with the most annoying possible alarm to rouse me each morning. It’s just a placeholder until I can hire somebody to tickle my feet with a feather and sing me awake while injecting caffeine into my IV drip. It’s good to have goals. You never cease to impress me, baby. I love what you did with the munchies. It looks super adorable; Martha’s probably so jealous she didn’t think of it first. And the tray really is a nice table top for a coffee setup. Again, such a good little thinker you are. You make me proud, and i’m DAMN hard to impress. Daniel, you need to help me decorate my room next year. And now I know where the pineapple came from! ‘Twas very popular. I accidentally found your blog on the internet while browsing for different small place decoration/solution. I absolutely love your blog; so funny and informative. Talking about the alarm clock, I am the same way. I’m glad I’m done with waking up early in the morning after graduation!